With 2018 rapidly approaching, what might next year have in store for software companies across marketing, sales, HR, finance, corporate development and more? OpenView’s experts lay out their predictions for the year ahead. Take a look and weigh in with your own predictions by tweeting to @OpenViewVenture with the hashtag #2018SaaStrends. B2B marketing has moved away from a “spray and pray” approach to a more personalized conversation that treats leads like people. And this trend is so much more than just account-based marketing. More than ever, marketing in 2018 will be focused on storytelling and education all in an effort to build trust (and, of course, win deals). This new way of thinking will impact everything from brand voice to the marketing channels on which companies rely. Gone are the days of fully gated content and lead forms. Customers don’t want to just “give” away their information in the hopes of getting a response at some unknown date. They want to engage and learn. So, it’s not surprising that chat and messaging apps are an increasingly important part of the customer journey. In an effort to further engage with prospects and customers, we’ll see more companies mirroring the podcasting efforts of companies like Drift, InsightSquared, Zuora, Intercom and Slack. This new channel will not only provide additional brand building capabilities, but will give companies the chance to authentically interact with their communities while providing advice and best practices. Going forward, the companies that recognize the shift in B2B buyer preferences will be the ones that achieve the greatest differentiation, customer retention and success in the new year. To say the SaaS market is saturated would be an understatement – there are 5,000 marketing tech companies alone, up from 150 in 2011. And it’s not just marketing. Saturation is playing out in sales tech, security, HR tech and numerous other verticals, driven by forces like cheap infrastructure (AWS), global talent pools and the bountiful venture funding of the past few years. You can no longer stand out from the crowd with yet another “lean” product designed for the SMB market. Instead, you need to find pockets of the market with big, hairy pain points and build a robust solution with a clear and compelling value proposition. AI makes this shift even more urgent: there’s so much upfront work required before AI drives real business value that a true MVP is nearly impossible. If you have the courage and a clear value proposition, consider a moonshot instead of an MVP. Sales coaching is the number one activity driving sales rep performance and engagement, and with the continued focus on lowering CAC and shifting to inside sales models, this will only become more apparent in 2018. According to the 2017 SaaS AE Metrics report, a whopping 69% of companies are hiring sales reps with 3 years of experience or less. In this environment, rapid onboarding, continuous training and constant real-time coaching are integral to the success of your sales team. Yet, there are very few solutions aimed at helping us coach better. Automation has been all the rage in sales tech for the last few years – from research and prospecting tools to cadence and email management. In 2018, we’ll see a shift towards the sales manager and enablement. Solutions like Chorus.ai, Gong.io and VoiceOps are just the beginning – we’re already seeing how we can provide stronger feedback to managers and focus coaching time on key areas for improvement in order to impact rep performance and ultimately, drive revenue​. 2018 will be the year that companies finally pay attention to pricing. After all, it’s fundamental to how businesses make money and is a SaaS company’s most efficient profit lever. Yet, 53% of companies have no one on their team dedicated to pricing, even if it’s just one component of their job. Worse still, only 14% consider pricing before deciding whether to build a new product. This leads companies to miss revenue targets and waste precious product and engineering resources. But in 2018, this is destined to change. Investors and executives will wake up to the amount of money they’re leaving on the table by failing to focus on pricing, and finally take steps to address it. Given that opportunities in tech continue to rise steadily across all business units, “qualified” candidates are in higher demand than ever. So what does this mean? For one, candidates have much more leverage over current and future employers to demand better, more relevant perks. As the millennial workforce matures, the benefits and perks they’re looking for are changing. Where unlimited beer, ping pong, and office happy hours were once highly sought after by entry to mid-level candidates, people are now more drawn to the more elusive tech perks like parental leave, work life balance, and training and development. compensation changes 2018 is likely to bring. More than ever before, CEOs and founding teams appear to be genuinely committed to bringing female executives onto their boards. Media and research reports have brought greater visibility to the lack of diversity in tech leadership roles (and the lost opportunities this lack breeds). This increased focus is likely to continue through next year. Organizations like the Athena Alliance, which are committed to helping qualified women gain board seats, are making these efforts possible. In 2018, boards that remain 100% male will be further pressured to bring diversity to their organizations starting from the top down. While hereto date, diversity efforts in tech have been largely focused on gender, in 2018 diversity initiatives are likely to broaden to address racial and ethnic disparities – take for instance that less than 5% of tech’s workforce is black. Advocacy for minority groups in tech should and will gain more momentum and visibility in the year to come. In addition to help from advocacy groups like the Athena Alliance, AI will be used to minimize biases in the hiring process. Why? AI removes emotion and inherent bias from the application and interview process, and instead sources and promotes candidates who are qualified and demonstrate relevant abilities regardless of their background. Take Avrio for instance – a talent platform that screens, scores and interviews candidates through AI, or Textio – an augmented writing platform that encourages unbiased job description creation. In 2018, AI in the HR tech stack will play a major role in creating more diverse candidate pools and therefore more diverse workforces within the tech ecosystem. 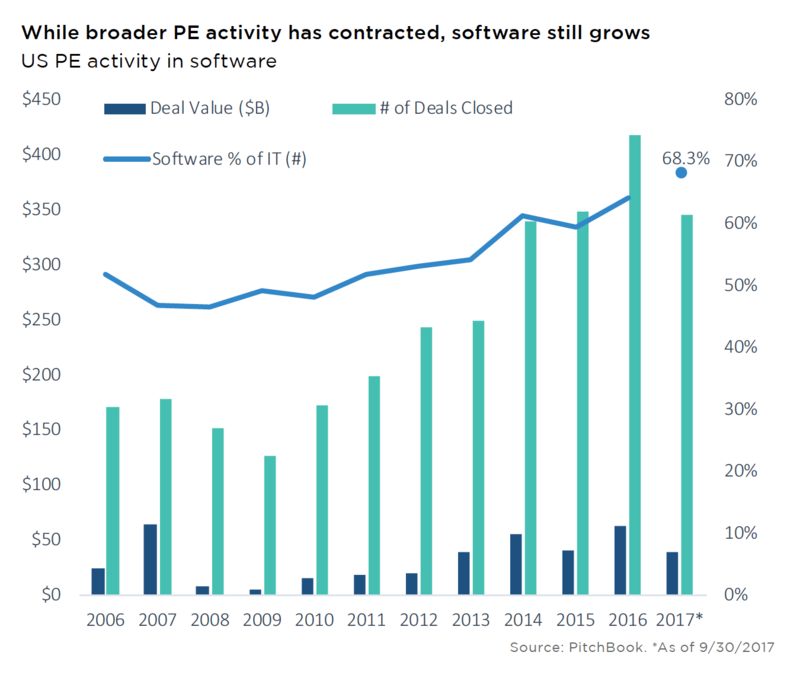 In 2018, we’ll see the persistence of a recent trend: private equity buyout shops will dive further into tech, setting a new high water mark for deals completed in the software space. Continued interest and activity on the part of PE will prop up softening M&A markets as strategic acquirers step back amid recent consolidation, high prices, and potential changes to the tax code. There are several factors that will continue to drive this activity next year, including record sums of money being raised by PE, broader mandates as more firms chase smaller tech deals, higher priced tech deals, and perhaps most importantly, a growing understanding for and appreciation of the SaaS business model – particularly its recurring revenue nature, steady cash flows, low customer churn, and ability to scale without heavy upfront investment. All of these factors will result not only in more deals, but in higher pricing; in recent years we saw companies such as Marketo, SolarWinds and Cvent bought for 7 to 9x revenue; these are great outcomes for founders and investors, and we expect the party to continue in 2018. To learn more about positioning your company for a PE exit, read here. What are your SaaS predictions for the year ahead? Let us know in the comments or by tweet to @OpenViewVenture with the hashtag #2018SaaStrends.